Louise Evans leads the CAIS Supporting People team in Anglesey and Gwynedd, providing support to 85 people in their own homes and at 17 managed tenancies across the two local authority areas. 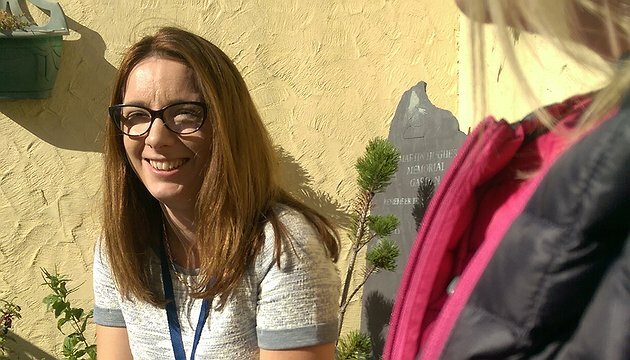 Research has shown that the national Supporting People programme saves the public purse £2.30 for every £1 spent in Wales – but Louise believes the incalculable impact it has made on the lives of thousands of people is much more valuable. During the two years she has worked with Supporting People, Louise has seen many vulnerable people come through the service – and leave with better independent living skills, and greater chances in life. “It’s great to take somebody from being homeless right the way through to being in their own flat, and settling down to a new life,” Louise said. “It might be a 12-month journey for someone who was on their own, sofa surfing or whatever – but when you help them achieve those milestones, that’s really rewarding. She knows the security created by a settled home life has knock-on effects in other areas. “The real benefits of Supporting People are all about giving someone a safe and secure home – and you just can’t quantify the confidence that gives someone in their day-to-day lives,” Louise said. “But it’s the little things, too. Things like having the confidence to pick up the phone and call the doctor themselves – which some clients may just not have been able to do previously. CAIS Supporting People works across Wrexham, Conwy, Denbighsire, Gwynedd and Anglesey, and at Northgate House in Pembrokeshire, providing a vital service to hundreds of people each year. The empathetic and understanding team build trust with some of the most vulnerable people in society, and help them towards stable housing, improved mental and physical health, and better employment prospects – while reducing instances of substance misuse and crime. Louise has seen how Supporting People enables and empowers service users to change their lives for the better. “Like one of my colleagues says, we’re cheerleaders for our clients – we don’t do things for them, but we help them to see what they need to do, we support them, and we help them to believe in themselves,” she said. “To me there’s nothing better than bumping into somebody you have supported in the past in the street – they’re still doing really well, they might have got a job, or be back in contact with their family or whatever… That’s really lovely to see. Our Supporting People projects empower people to live independently in the community by providing both accommodation and support to learn the skills needed to keep a tenancy. They offer a stepping stone for people with a history of drug or alcohol misuse, mental health issues, or offending, allowing them to reintegrate and live settled lives. Supporting People also provides the opportunity to develop daily living skills, and access benefits, education and employment. Our Floating Support service helps people who are concerned about their substance misuse or mental health and who need assistance to maintain their tenancy or live safely in their own home. Find out more about the CAIS Supporting People service here. In Pembrokeshire? Find dedicated information about Northgate House here.